Ireland lost by 11 runs to Papua New Guinea in Townsville but finished as 2-1 winners in the three-game T20 series. Sese Bau (25) and Charles Amini (24) helped Papua New Guinea post 116-8 in Tuesday's dead-rubber while Tim Murtagh picked up three wickets. Niall O'Brien top-scored with 27 in Ireland's disappointing response and captain Gary Wilson hit 15 on his 200th appearance. Ireland slipped from 49-2 to 105 all out on a sluggish pitch. Papua New Guinea managed just three fours and two sixes in their innings, giving an indication of the difficult conditions. Murtagh (3-23) was the best of the Irish attack while spinner George Dockrell (2-15) picked up two wickets. Chad Soper (3-13) removed openers Paul Stirling (eight) and Andrew Balbirnie (five), but a steady stand of 31 between Niall O'Brien and Wilson looked to be steering Ireland towards victory. However, Wilson's dismissal was followed by Kevin O'Brien's first ball, and Ireland were on the slide. Despite brief cameos from Stuart Thompson (10) and Andrew McBrine (10no), the visitors were dismissed in the last over for 105. 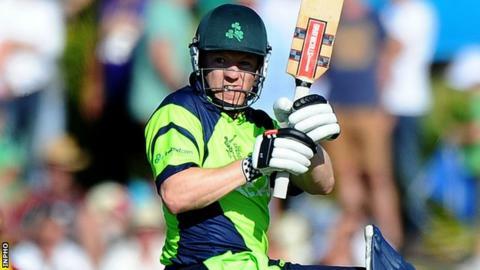 Ireland travel to the United Arab Emirates to play a warm-up against a club side on Saturday before taking on the hosts in two T20s on Sunday and Tuesday.